Treasured for thousands of years, sandalwood is a uniquely fragrant wood known for its distinct color and its ability to support intricate carvings. 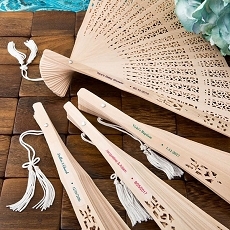 Each foldable, natural-sandalwood-colored fan measures 8" x 14" and has an intricate carved design on its panels with a delicate white tassel attached to its handle. Perfect for summer occasions, outdoor weddings, garden parties and much more, each Fashioncraft exclusive sandalwood fan favor comes packaged in a white gift box. Q: is this really scented? I already ordered samples from 2 different companies and i received the unscented ones even though it says they're scented. thanks. A: It is not actually scented. It is made of sandalwood which in itself is naturally fragrant but loses some of its scent with time.